Tim Elliott of Winecast hosted last month’s Wine Blogging Wednesday #74 and posted his round-up earlier this week. In it, he notes that 19 bloggers participated tasting 39 wines in 8 countries. The least expensive wine was Albero’s Brut Cava ($8 at Trader Joes and at that price a favorite for me too that I almost tasted for this prompt!) and the most expensive sparkler was $22.50 – 8th Generation “Confidence” 2010. So go check it out! Your mission is to procure a wine produced from grapes grown in a single vineyard, and tell the world about it on March 21st. You can pick any wine style, made from any grape(s), hailing from any region of the world – go nuts, go obscure, go fun and wow us all with your smarties. As for me, right now I’m inclined to go local and do a single vineyard that’s in Ventura County. I’ve got a bottle of Ojai Vineyard’s Roll Ranch Syrah and I want to see if I can make a road trip up the hill to the vineyard for some spring photos. We haven’t had much rain this year around here but I am sure it will be beautiful. Then in April, I’ll be writing about Santa Barbara’s Zaca Mesa and wines you might to pair with your Easter dinner. I might even find time to get up there myself–it’s only about an hour drive from where I live. So Happy Wine Wednesday! What will you be drinking tonight? We’re having one of my favorite dinners –seared tuna on a bed of fresh greens –which I love with silky Washington Merlot. 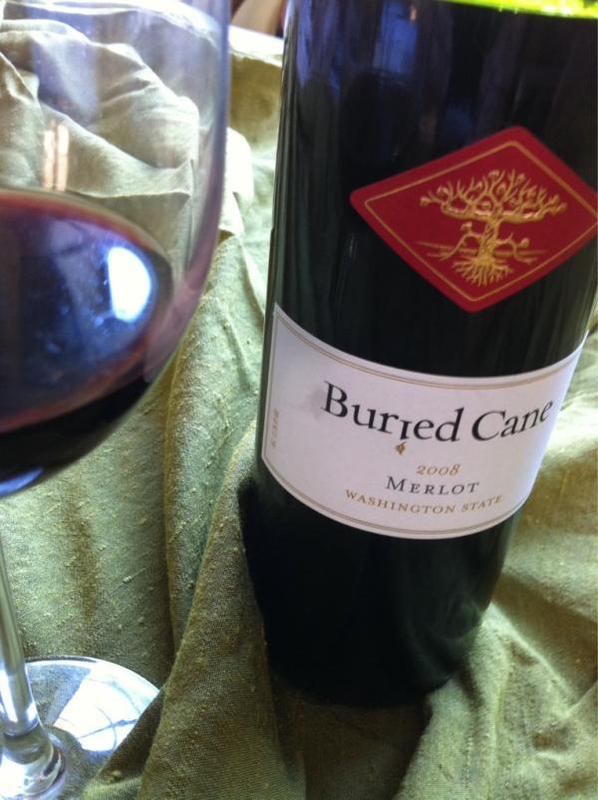 This 90% merlot and 10% syrah blend is considered a value wine that usually retails for around $15; at $3.50 it’s a steal and I’m going back for more. The wine is sealed with a easy opening screw cap and an easy mid-week wine alcohol % of 13.3. It has a nice rosy red color with a faint tinge of coral, cherry and plum on the nose and palate plus some vanilla and cigar box. It’s mild with a nice finish and a hint of caramel. Hi Gwendolyn ~ What a *cool* premise! As it happens, at the International Alsace Varietals Festival last weekend in the Anderson Valley of Mendocino, during the Technical Conference (enough prepositional phrases for ya? ), there was a really eye-opening New Zealand Riesling tasting. Twelve winemakers were given identical lots of Riesling grapes, from an excellent site, and were asked to make *their* best wine from them. And contrary to every notion of terroir I’ve ever encountered, *the 12 wines tasted amazingly different from one another! * Some were bone-dry; some were noticeably sweet. And my scores ranged from 85 to 96. We may be writing something for the WBW 75. I’m thinking we may talk about Cabernet Sauvignon from Danielle Cyrot at St. Clement. A singles night with wine? Sign me up! What is even better is a single girl day out wine tasting. Now that is a good time, having a good time with your friends and there is no pressure! I’ve done this a few times with my friends in Santa Barbara and we had a great time in the process! We’ve had a few follow up trips and they were all a success! I plan on doing it again sometime soon, though were not all single still it is still a great time. Thanks – can’t wait to see your WBW75 selection!